Harvard Business School Press, 9781591393092, 287pp. If leaders are made, not born, what is the best way to teach the skills they need to be effective? Today's complex times require a new kind of leadership--one that encompasses a mind-set and capabilities that can't necessarily be taught by conventional methods. 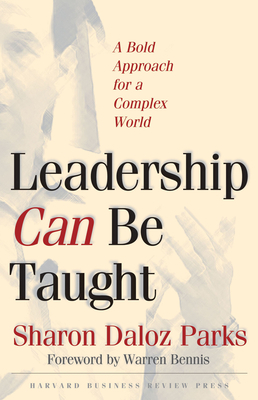 In this unique leadership book, Sharon Daloz Parks invites readers to step into the classroom of Harvard leadership virtuoso Ronald Heifetz and his colleagues to understand this dynamic type of leadership and experience a corresponding mode of learning called "case in point." Unlike traditional teaching approaches that analyze the experiences of past leaders, case in point uses individuals' own experiences--and the classroom environment itself--as a crucible for learning. This bold approach enables emerging leaders to work actively through the complex demands of today's workplace and build their skills as they discover theory in practice. Through an engaging, you-are-there writing style, Parks outlines essential features of this approach that can be applied across a range of settings. In the process, Leadership Can Be Taught reveals how we can learn, practice, and teach the art of leadership in more skilled, effective, and inspired forms. Sharon Daloz Parks is director of leadership for the New Commons--an initiative of the Whidbey Institute in Clinton, WA. She has held faculty and research positions at the Harvard Divinity School, Harvard Business School, and the Kennedy School of Government at Harvard University.